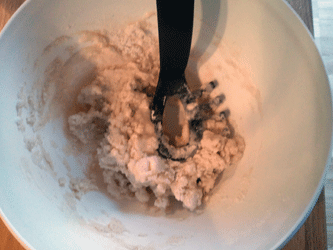 Like many playdough recipes, this playdough recipe uses salt. There’s no cooking involved, just mix the ingredients and enjoy! We like it simple but effective. If you want to use food coloring, make sure to mix it with the water before adding it to the other ingredients. Knead the mixture until it’s doughy. 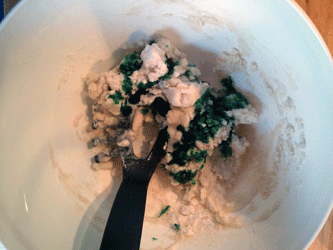 Several of our playdough recipes can be eaten, like the edible playdough recipe. The salty playdough recipe presented on this site is not suitable for eating, just don’t try it! Here you can find the extended description for this recipe, with step-by-step images and instructions. This recipe includes alot of salt, it will dry out your hands, use lotion after handling the playdough. Before starting with your playdough, make sure you have all ingredients available. 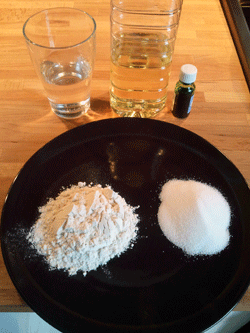 Here we have the water, oil, salt, flour and food coloring. This recipe works well with or without food coloring. I made two mistakes using this recipe. First mistake was that I decided to go with food coloring but didn’t mix it with the water before the other ingredients. The second was trying to use somehting else but my hands to knead. Below you can see all ingredients added but the food coloring. This is how the mixture looks when the food coloring is added last, you should instead mix the food coloring with the water and then add the water to the dry ingredients and the oil. Since I didn’t do that, the finished playdough will have a sort of grainy, green color, instead of the smooth color we want. Trying to use anything but your hands to knead, is just a waste of time. Here is my finished playdough. When got my act together and started using my hands the end result turned out ok, but it would have been better with the food coloring mixed with the water. I’m here to try all these playdough recipes for you, in order to avoid future mistakes when you try the playdough recipe yourself. 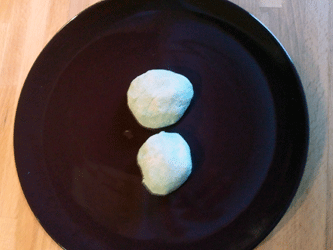 This time I did some mistakes, so learn from them and make your own playdough even better. Good luck! My kids (ages 6, 5, and 21 months) are thoroughly enjoying this playdough. I think I will grab a cup of coffee! Adim do you know if you bake it ??????? I love this recipe but I was wondering how long can you keep the play dough for ? And how to store it? Thank you ! Store it in an airtight container. You can keep it even longer if you kep it airtight in the fridge. It’s good as long as it smells ok and is actually working as playdough. put it in a zip lock bag and keep in in your fridge or not but I found best results when keeping in in the fridge! Thanks for the recipe! My daughter needed to make a diorama for school. We used whole wheat flour and got the perfect color for earth and skin tone. A dash of cocoa powder works great too! I am 12 and I have been looking for a playdough recipe to make to entertain myself and friends and this website has soo many cool recipies I can’t wait to try some more of them! Fantastic! Very glad to hear. I hope your daughter gets well soon! Very tasty and fun to play with. What? Tasty? Noooo way, don’t eat it hehe! Any tips for if its sticky? add more flour until does not stick to your hands. another tip is to put flour on your hands before you start kneading the dough, it prevents the dough stinking to your hands and you dont have almost all the mixture on your hands and not in the bench. When r u going tk add glittery recipie just becuz I have seen it in the comments and that would be like Awesome ya no?!??!?!?!?! WHAT IS BETTER TO USE FOR A PROJECT THE SALT DOUGH OR REGULAR PLAYDOH? 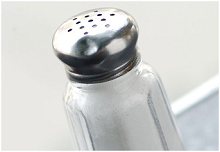 CAN YOU USE SOMTHING ELSE BESIDES SALT BECUASE I DONT HAVE ALOT OF SALT AND I WANT TO MAKE SOME WITHOUT SO MUCH SALT. This was really fun; my only comment is that you should use FINE grain salt. And it may be obvious to everyone else, but if you have a kid with a cut on her hand, maybe try a different recipe – the salt hurts a little. THANKS NOW I know that if my kids have a cut that they shouldn’t help me !!!!!!!!!!!!!! Emmm…… do you know if you bake it or what ????? Hi!!! I’m 13, and i am the oldest of 7 kids! (two r older than me.) I tried this recipe, and they loved it. Even i had a lot of fun with it! Thx for the help, and keep up the good work! good job!!! The first time i made a mistake, but now its great!!! Great! You are very welcome! Recipe worked great! My daycare kids and I had a blast making it, and playing with it! Could you bake it, and it be hardened? CAN YOU USE ANY SALT ???????? WHAT IF ITS STICKY ??? mine was sticky at first, I just added small amounts of flour at a time and kneaded it until it was the perfect consistency. Hope that helps. I was searching for a playing dough recipe, and I am so lucky that I got it from here. Thank u for sharing it even if there is mistakes. i can correct as u mentioned .